The legacy of Colorado’s notorious nuclear plant is radioactive waste in a residential community—and public distrust of government. Adapted from Full Body Burden: Growing Up in the Nuclear Shadow of Rocky Flats (Crown Publishers), published June 5, 2012. © 2012 Kristen Iversen. At the top of the hill behind our house stands the Arvada cemetery. The year 1863 is etched in a stone marker at the entrance. The cemetery works like a magnet. As soon as our mother puts us out into the yard for the afternoon—just like the kids and grandkids on the family farm back in Iowa, who were expected to fend for themselves for the day—my sisters and I scramble over the fence and head for the hill. We trek across the field behind the row of backyards and through the old apple orchard and get up to the creek, where we balance a flat plank across the shallow, sluggish water and tiptoe across. At the crest of the hill stand row after row of headstones. Some have the names of children or images of their faces etched in the stone, and we stay away from those. We look down the hill to our house and imagine our mother, big and round, lying on her bed and waiting for the next baby, a boy at last, she’s sure of it. A little farther, we can see the Arvada Villa Pizza Parlor and the Arvada Beauty Academy. Between our neighborhood and the long, dark line of mountains stands a single white water tower, all by itself. The Rocky Flats water tower. There is a hidden factory there. That factory is the Rocky Flats Nuclear Weapons Plant, a foundry that smelts plutonium, purifies it and shapes it into plutonium “triggers” for nuclear bombs. A largely blue-collar link in the government’s nuclear bomb network, Rocky Flats is the only plant in the country that produces these triggers—small, spherical explosives that provide an atomic bomb’s chain reaction. From 1952 to 1989, Rocky Flats manufactures more than 70,000 plutonium triggers, at a cost of nearly $4 million apiece. Each one contains enough breathable particles of plutonium to kill every person on earth. Rocky Flats’s largest output, however, is radioactive and toxic waste. The American nuclear weapons industry has for decades produced waste with little thought to the future or the environment. Virtually all radioactive waste produced with each gram of plutonium remains with us today. But no one in our community knows what goes on at Rocky Flats. This is a secret operation, not subject to any laws of the state. The plant is operated by Dow Chemical. My mother believes they’re making Scrubbing Bubbles. The wind blows, as it always does. The chill of evening begins to creep up the hill; the air turns cold when the sun dips. “Let’s go!” my sister yells, and we jump to our feet and roll and tumble down the hill. We bounce across the plank and race across the field, full speed, before the sun sets and the ghosts come out. The name Rocky Flats is taken from the dry, rolling land dotted with sage and pine trees, a name chosen by early homesteaders who raised cattle and hay. Now it will no longer be ranchland. The money is in housing. Jefferson County and the entire Denver area are booming. Just over half a million in 1950, by 1969 the population of the Denver metro area has more than doubled. Jefferson and Boulder counties are two of the fastest-growing counties in the country. 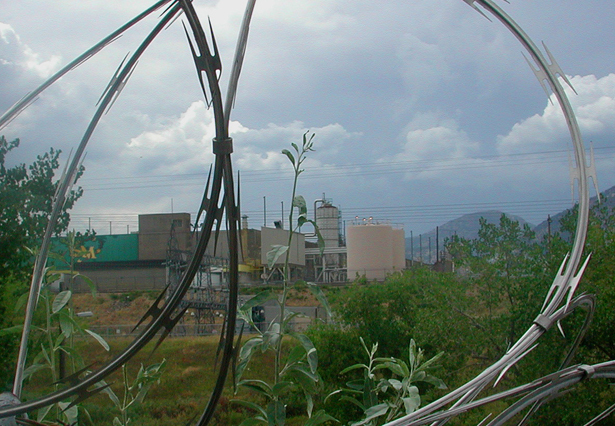 The plant is surrounded by two tiers of barbed-wire fence stretching ten miles around the circumference of the core area. The first tier, three feet high, is to keep cattle out. The second tier, nine feet high, is electrified and patrolled by guards with guns, high-powered binoculars and, eventually, tanks. With the exception of a two-story administration building, the plant’s buildings are built low to the ground, in ravines cut deep into the soil. The factory is almost invisible from the road. By early 1952, things are in full production. The product that comes off the factory line at Rocky Flats is a well-kept secret. By 1969 more than 3,500 people work at the plant. No other nuclear bomb factory has ever been located so close to a large and growing population. In 1969, the year we move into a new home even closer to Rocky Flats, a devastating fire brings the Denver metro area close to a major nuclear disaster. A radioactive cloud travels over our house and beyond. No one knows. In 1973, Dr. Carl Johnson, a public health physician, is appointed director of the Jefferson County Health Department. When he is asked to approve home building permits on contaminated land near Rocky Flats, he spearheads research to determine if local residents have been affected by the activities of the plant. By 1978 news of Johnson’s research begins to reach the public. In his published study, he demonstrates a stark pattern of “excess incidence of all cancer in all age categories” and both genders in areas exposed to Rocky Flats contamination, from lung cancer, leukemia and lymphoma to thyroid and brain cancer in females. By 1962, five years after an explosion leads to a devastating uncontrolled fire that sends a plume over the Denver metro area, leukemia deaths in children who had lived near the plant are twice the national average. Before the construction of the plant, they’d been below the national average. In Area I, which extends thirteen miles downwind from the plant, Johnson finds that males have a 24 percent higher cancer rate, females a 10 percent higher rate. Lung and bronchial cancer for males is about 33 percent higher than in unexposed areas. In Areas I through III, Johnson makes a “most unexpected discovery”: forty cases of testicular cancer, “an unusually high incidence.” Ovarian cancer is also higher than expected, at 24 percent higher than in exposed areas. Johnson also finds that workers at Rocky Flats have eight times more brain tumors than expected, as well as triple the number of malignant melanomas. In addition to plutonium, other radioactive and toxic materials keep showing up in the environment: cesium, curium, strontium and carbon tetrachloride. When scientists go out to collect soil samples in residential areas around Rocky Flats, they wear protective face masks and don’t stay on the property very long. “So how can children play in it year-round?” Johnson asks. Carl Johnson is an unlikely renegade. He’s a quiet, gray-suited man with black-framed glasses that give him a scientific look, a man conservative in his politics. But he doesn’t back down. In January 1980, for the first time the EPA admits to the press that it believes cancer deaths from Rocky Flats contamination may occur among Denver residents. This conclusion is based on reports prepared by the Department of Energy and on the fact that air-monitoring stations at Rocky Flats have consistently shown higher levels of plutonium-239 than any others in the Western Hemisphere. All this news is becoming a problem for the county commissioners, the county board of health, the DOE and Rockwell. For them, business is the name of the game, and no one wants to hear about contamination. It’s a tight group: the county commissioners, who monitor business growth and new home development, appoint the county board of health. The county board of health in turn appoints the health director. Although Rocky Flats is run by Rockwell, it is regulated by the DOE. Rockwell receives bonuses from the DOE based on production. What counts is the number of triggers produced. The Atomic Energy Act of 1954 exempts nuclear weapons plants from environmental laws. The question is how to keep someone like Johnson from releasing more alarming reports to the press. Attempts to censure Johnson in 1977 and 1979 are unsuccessful. However, on May 1, 1981, the balance of power shifts when the county board of health appoints the president of the Jefferson County Homebuilders Association to the board. Two weeks later, the board votes 3–2 to force Johnson’s resignation. One dissenting board member, a hydrologist with the US Geological Survey, notes that most of the county commissioners want “a house on every tenth of an acre in the county” and Johnson is standing in their way.In June 1989, after finding evidence of environmental violations, the FBI and EPA raid the plant, the only time in US history that two government agencies have raided another. The raid leads to a two-year grand jury investigation. After twenty-one months of work, on May 18, 1991, the jurors, led by cowboy Wes McKinley, vote to indict Rockwell, five of its employees and three others working for the DOE. But in a surprise move, Justice Department prosecutor Mike Norton refuses to sign the indictments. Not a single Rockwell or DOE official is indicted, even though more than 400 environmental violations occurred over the decades. Instead, Norton negotiates a plea bargain with Rockwell. The deal drops waste-dumping and incineration charges and all charges against individuals; their immunity is guaranteed. In return, the Rockwell corporation will agree to plead guilty to criminal violations of the federal hazardous waste law and the Clean Water Act, admitting to five felonies and five misdemeanors. The criminal conduct includes “possible exposure of workers and local citizens to radioactive and hazardous waste that was sprayed into open pools and even stored in ventilation vents.” And Rockwell is required to pay an $18.5 million fine, at the time the second-largest in US history for an environmental crime, following the 1989 Exxon Valdez oil spill in Alaska. Yet this $18.5 million fine is a smaller amount than what Rockwell has collected in bonuses for meeting production quotas at Rocky Flats—bonuses that were paid despite the DOE’s ranking of Rocky Flats as “the most dangerously contaminated site” in the nation’s nuclear weapons complex. Perhaps most devastating to local communities, the agreement also indemnifies Rockwell from any further claims and closes the door on all future prosecution, whether criminal or civil. Judge Sherman Finesilver approves the plea bargain and tells the grand jurors that their work is finished and they can now go home. The jurors are bound by an oath of secrecy, even after the case is closed. But they have heard almost three years of damning testimony. They want indictments, and they want the public to know the truth about Rocky Flats. Rather than go home, the jurors consider their oath, consult the Constitution, look over the evidence again and write their own grand jury report—without the help of prosecutors. They ask Judge Finesilver to release it to the public. On September 25, 1992, he rules that the report will remain sealed. A few days later, much of the report is leaked. A detailed account is printed in Westword, a Denver alternative newspaper, and excerpts appear in Harper’s magazine. Finesilver calls for the Justice Department to investigate whether grand jurors should face criminal charges. The jurors become known as “the Rocky Flats 23,” the first grand jury in history to risk incarceration for revealing information critical of the Justice Department. Twelve jurors write a personal letter to President-elect Bill Clinton, asking for a special prosecutor to investigate the government’s plea bargain with Rockwell. There is no response. In January, seven of the jurors appear on Dateline NBC to discuss the trial and why they feel it is a miscarriage of justice. With the final report of the scuttled grand jury sealed by the judge, the secrecy continues and the public is still not fully informed about the ongoing contamination at Rocky Flats. I miss the raid and the grand jury investigation; I had left Colorado for job and family reasons. When I return, my circumstances have changed. I’m a single parent with two young boys, working to put myself through graduate school. I need a job with flexible hours that pays well. Rocky Flats is the best job in town. Like many of the kids I grew up with, I end up working at the plant. One evening I come home from work and I’m shocked to see a Nightline investigation on TV about Rocky Flats. Interviews with DOE and Rocky Flats officials confirm that as much as 1,320 pounds of plutonium is stored around the plant, much of it unsafely, and contaminated groundwater has spread to suburbs of Denver, including the neighborhood where I grew up. Unbeknownst to the public, the two fires in 1957 and 1969 had sent toxic plumes throughout the Denver area, and for years the plant had routinely released plutonium into the air. I never knew. In 1995 I quit my job and begin the many years of research that lead to my book Full Body Burden, which tells not only my story but those of other residents and workers, people whose lives have been profoundly affected by Rocky Flats. Today, the Rocky Flats site looks pristine, but it is not. The DOE originally said it would take seventy years and $40 billion to clean up Rocky Flats, and it wasn’t sure it had the technology to do it. This was modified to an agreement that partially cleaned up only the top three feet of soil and allowed much more contamination to remain, particularly below six feet. Cleanup was declared complete in 2005. More than 1,000 acres of the site are so profoundly contaminated that they can never be open to the public. The rest of the site is slated to open as a wildlife refuge and public recreation area for hiking, biking and possibly hunting. After a twenty-year legal battle, in 2010 the Court of Appeals for the Tenth Circuit overturned a $926 million award in a class-action lawsuit against Dow Chemical and Rockwell International, stating that the more than 12,000 property owners had not proved that they or their properties were damaged from plutonium that blew onto their properties. There are no signs at Rocky Flats to tell what happened there, or why anyone should worry about the deadly legacy that remains. Extensive home-building, highway and road construction, and commercial development continue. In recent weeks, citizen activism temporarily stopped the planned construction of the Jefferson Parkway, a highway that would run adjacent to Rocky Flats and spur expansive development in the area. Boxes from the Rocky Flats grand jury investigation are still sealed. Rocky Flats still keeps its secrets. Kristen IversenKristen Iversen is an American writer of nonfiction and fiction, and the author of Full Body Burden: Growing Up in the Nuclear Shadow of Rocky Flats (2012) and Molly Brown: Unraveling the Myth (1999).